10/7/2018 ~ Foreclosure Awareness in the wellspring of our Collective Conscious is like water that flows everywhere, washing away dirt, refreshing, changing the dry and lifeless to life supporting. The legal system in the United States has become dry and lifeless. It has become mechanized to favor corporations, banks, wealth in general. A justice system, on the other hand, is alive with good pulsing through the veins of laws that it upholds, nourishing people and allowing them to flourish. Peter Max’s Ascending Angel reminds me of a pump. Once, when we arrived at my grandparents’ cottage, “Up North” in Wisconsin, we found the pump did not work. I was about five at the time and was both alarmed and curious that the squeaking pump handle was unaccompanied by a splash of water. Grandma said, “You just need to prime the pump.” She poured water onto/into it, and low an behold, pumping brought forth water. 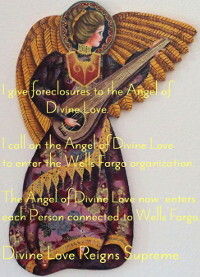 Anger at the idea of a free house is the foundation upon which banks are allowed to violate the Constitution by not serving Homeowner Defendants the Complaint, resulting in default foreclosures. 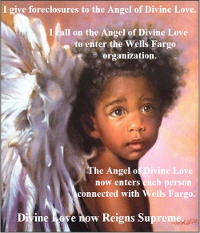 A bank using fraud in a foreclosure, like robo signing, saying they have the original note, when that is a lie, filing false affidavits, is all okay since none of that is as offensive as the idea of some person or family getting a free house. So, based on that very strong sense of, “If it’s right for me to do it, then it’s wrong for you not to do it,” banks and other lenders are allowed to do nearly anything they want because it doesn’t personally offend anyone, other than the victim of the crimes. For us to prime the dry legal pump and restore it to a functioning pump pouring out the water of justice we, by way of our Collective Conscious, need to give up our sense of more deserving vs less deserving. Once we do that, once we take our feelings that are separate from true justice, and pour them into the pump of greater good, we will restore our legal system to a functioning justice system. The outcome will be a few people indeed getting their home without having to continue paying their mortgage, but far more importantly, it will be banks and lenders recognizing that we are insisting on justice. 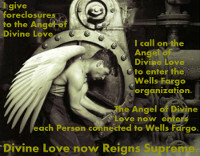 With that recognition will come the loan modifications we were promised when our tax dollars bailed out banks and Wall St.
Foreclosure Awareness in the wellspring of our Collective Conscious is powerful, far more powerful than corruption. 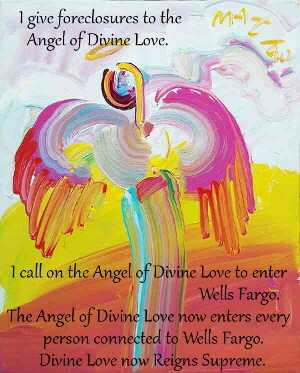 Art Credit: Ascending Angel by Peter Max.